The Wiegands: the shine project. threads. With every purchase, you get a thank you card written and signed by the student that made your bracelets! Ashley is a dear friend of mine and I could not be more honored to share Threads with you all today. She is doing big & beautiful things in this world! It's phenomenal to watch!! Check out the shop here & let me know what you would use your credit on! *tweet, status update/blog post- comment for each! love the double wrapped wood bracelets!! i follow her facebook (sandy chang)! I love a good cause more than anything. this is a great one! I would use a credit to get my MIL some change bracelets and a 3 star necklace for her upcoming birthday. I LOVE LOVE LOVE this idea - fabulous! I follow you in my Google Reader and just visited the Thread Shop - If I won, which I'm crossing all my toes and fingers that I do...I would choose between the Double Wrapped Hope and Wood Bracelets and Roderigo! I love the double wrap wooden bracelets! Totally cute. I like TSP on Facebook! I would be spending the credit towards getting the infinity bracelets for my GLOW girls. The 10-13 yr olds I lead at church!! I follow the shine project! Shared it with my facebook friends! I love Ashley's tees!! Favorite item from the shop!! I love the double wrapped wood bracelet. So cute! what a lovely business! cheers! i'm a follower of your blog! what cool bracelets! i love the vanessa bracaelet with the geometric beads! i follow the shine project blog! These bracelets are wonderful, but what they stand for is even better! i follow the shines project on twitter! Went to the shop- love the neon neon and double wrapped wood bracelets! I love the Alex bracelet and the double wrapped wood bracelets! What a great cause! 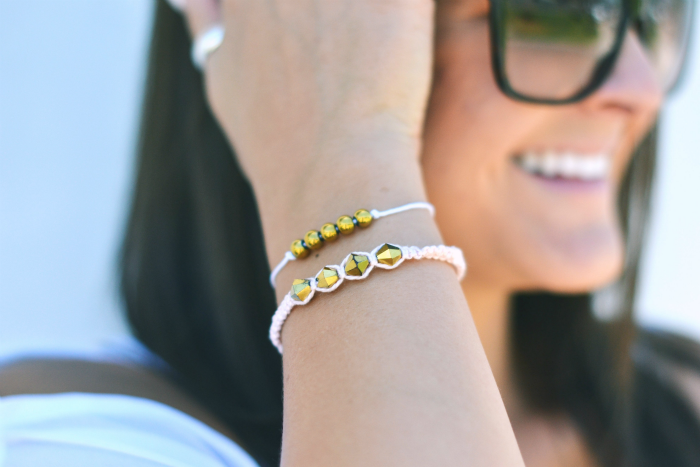 I love the double wrapped hope bracelet! I love those bracelets! I would definitely buy the infinity bracelet and the one made by Alyssa. Such beautiful bracelets! I follow your blog Casey! i would love the wooden wrap bracelet! I would get the vanessa bracelet, so pretty! This is so cool! I follow your blog! love the double wrapped wood bracelets! WOw, this is the coolest thing I've seen in a while! What an amazing ministry!!!!!!!!!!!!!!!!!!! Can't wait to see how lives are changed. Way to go Shine Project! I would get the wooden wrap bracelet!! I followed the Threads blog! I liked Threads on Facebook. these are becoming popular little gems :) love these bracelets. i'm a follower! ooh, i really like the change bracelets! Already following the shine project, she's so inspiring! All over the shine project on the Facebook! Gush over a little artsy on facebook every day! I would buy from her shop the change bracelet or the neon neon one. But there are so many cute things to choose from. What I great idea! I love it! I LIKE ShineProject on FB! So hard to pick a favorite but I love the double wrapped wood bracelet, the vanessa, mary and the change bracelet! I love the Change bracelet! delicate but still bold! I follow Ashley on twitter too! I follow you on Bloglovin' too!! oohh i love it! i would totally get a shirt and a necklace!! i definitely found my site for gifts!! thank you! i like TSP on fb! 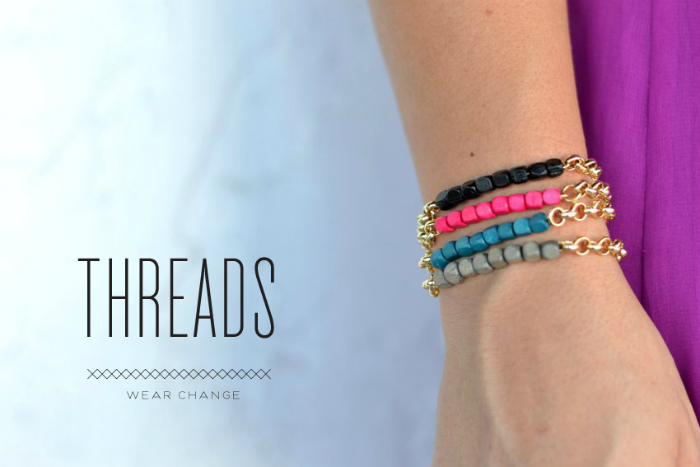 I checked out the Threads shop...and I LOVE the double-wrapped wood bracelet and the Vanessa! Such cute stuff! i would like neon neon, roderigo, & forever bracelet!